It may well be an overused cliché, but this day trip is truly, ‘off the beaten track’ but for those who dare, the rewards are worth the effort. Once again, the starting point for our adventure was the luxury farmhouse Campo Verde, nestled cosily in the village of Vilatan. It was a bright sunny morning as we crept slowly along the narrow village lanes and on to the main road heading towards the town of Monforte de Lemos: beating heart of the Ribeira Sacra wine growing region. From here we joined the N120 west bound, following signs for Ponferrada. Within 40 minutes we had arrived at our first destination, A Rúa. 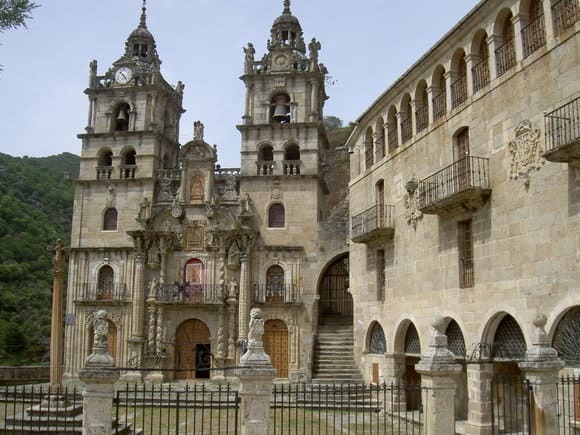 This sleepy town in the province of Ourense is home to some of the best wines in Spain: indeed, in 2011 the renowned US wine critic Robert M. Parker catalogued wines from A Rúa as elite in the world of wines. One of my personal favourite is Pingadel (Godello) a fresh and fragrant white wine from the Virgin de las Viñas Bodgea Coop (Campo Grande 97, 32350 A Rúa, Ourense, +34 988310607). 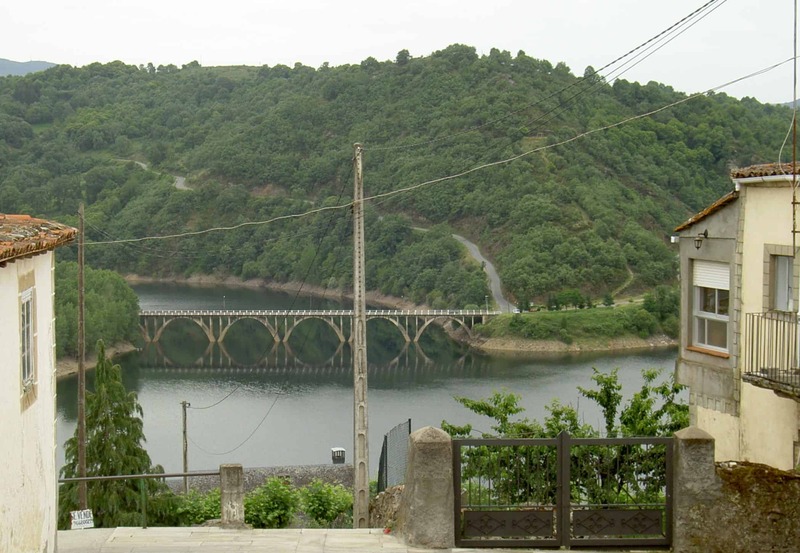 Dominating the town is a large reservoir, encoro de San Martiño, formed by the dam of the same name. A wide promenade runs along its western edge, ending at a lakeside café. It’s the perfect place to take a break and soak up the magnificent scenery; if it’s not too early, why not try a glass of Pingadel. Having finished our refreshments we continued on, heading south along the OU-533 for about 14km. The road heads into the mountains, twisting and turning through acres of vineyards. Keep an eye out for signposts to the sanctuary or you’ll miss this hidden treasure and drive straight past. El Santuario de la Virgen de las Ermidas, is open everyday from 11 a.m. until 2 p.m. and takes its name from a sacred artefact discovered in the area. Legend has it that a group of herdsmen, from the nearby town of O Bolo, were drawn to the entrance of a hidden cave by their cattle. Inside they found a statue of the Virgin Mary holding her newborn child. A small shrine was built to house the image. Construction of the magnificent building seen today began in the 17th century and was the result of a remarkable event. 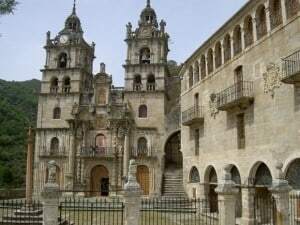 In 1624 the bishop of Astorga, Don Alonso Messia of Tovar, was visiting parishioners in the area when he became gravely ill. Physicians from Monforte de Lenos were called to attend; their prognosis was grave. Whilst lying on his deathbed the bishop experienced an apparition of the Virgin Mary. Miraculously he recovered, discovering several days later that the ancient statue of the Virgin Mary was identical to his apparition. Immediately he ordered the construction of a sanctuary worthy of such a divine miracle. The cool interior of the church is dark and sombre; and smaller than you might expect. Hanging from the ceiling, above the central aisle, you’ll find a model of a Spanish galleon. It was given to the church by Pedro Centro, following yet another miracle. On the 23rd September 1702 Pedro, a native of San Juan de la cuestas de Sanabria, was thrown overboard while serving in the Spanish navy. Unable to swim, he trod water for 3 hours before another vessel was able to save him. These types of ex-vetos are more commonly seen in coastal churches. 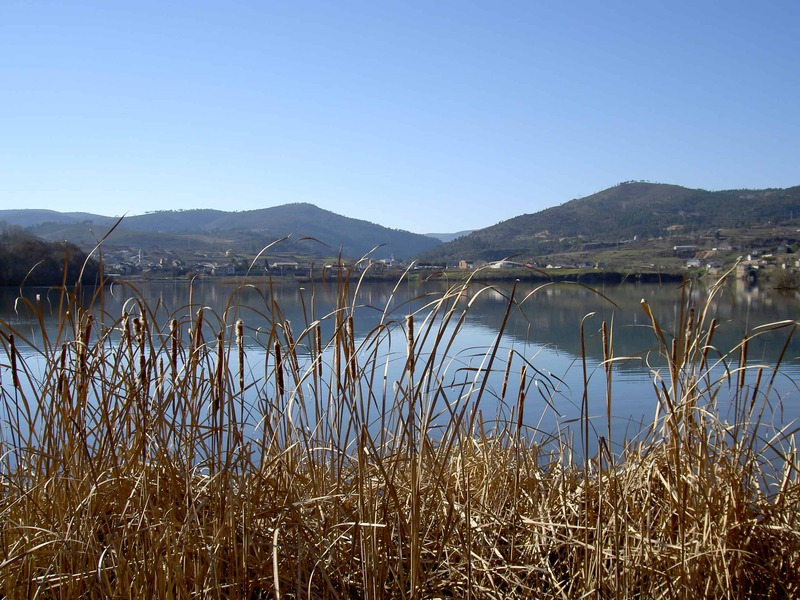 At first glance Viana do Bolo is an unremarkable little town, lacking some TLC; but dig a little deeper and you’ll find a charming inland community with a rich history and some remarkable vantage points from which to view the surrounding countryside. 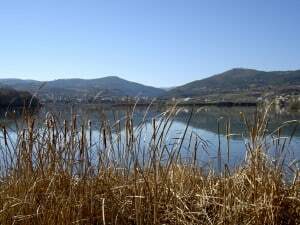 It also boasts one of the best restaurants in the area: A Nosa Casa (Rúa Libertade, 2 – bajo, Viano do Bolo, Ourense, 32550, +34 988 329 317). Galician beef is as revered in Spain as Aberdeen Angus is in the UK; and the best fillet steak (solomillo de tenera) I have ever eaten in Spain was served here: high praise indeed but fully justified. Having satisfied our hunger it was time to walk it off. Opposite the restaurant is the entrance to the Plaza Mayor. The square has a very French feel to it. We walked through the plaza and joined a narrow street which heads up towards the torre (tower). At the fork in the road we turned left and continued on to a small, roadside park. From here the views across the reservoir are stunning, particularly in late spring. The road bridge crossing the water marks the point where the Rio Bibei, to the left, merges with the Rio Camba, on the right. After taking in the sight we continued onward and upward, past the church and up some stone steps to the torre. The present torre dates back to the 15th century and was built on the site of an earlier tower constructed around 1180 by King Fernando II of Leon. Throughout the centuries it’s had many different uses, even doubling as a prison during the Spanish Civil War. Today the tower is used as a museum displaying cultural and artistic items specific to the area. We ambled our way back down the narrow lanes and began our return journey to A Rúa. The next point of interest on our tour was La Cruz de Santa Cruz. 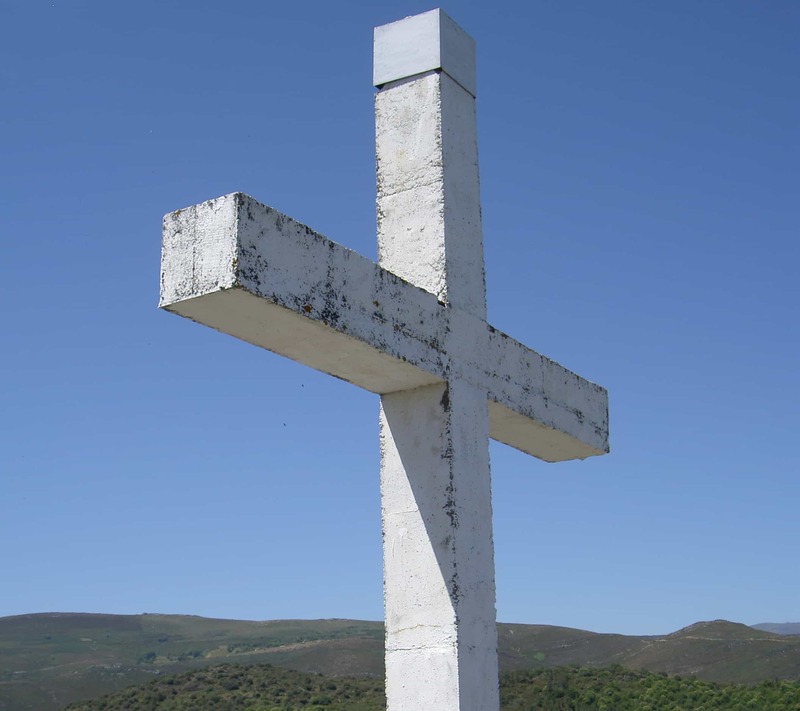 Perched on top of a hill, overlooking the village of Santa Cruz and the surrounding countryside is an eight metre tall, concrete cross. The inhabitants of Santa Cruz finished its construction in 1990, officially opening it to the public on 30th August that year. 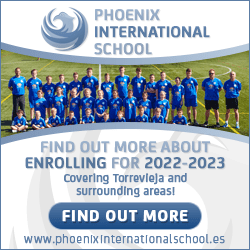 For villager Manuel Gonzalez Rodriguez, it was the realisation of a childhood dream. A dirt track leads to the entrance of this unusual landmark; as we approached a man appeared out of nowhere as if by magic. He introduced himself as Manuel and enthusiastically greeted us to his monument. Entrance is free and the attraction never closes. The climb to the top is quite steep and uneven but the outstanding views are well worth the exertion. The final stop on this tour was Torre Castelo do O Bolo (The castle and tower of O Bolo) just a short drive from Santa Cruz. The town of O Bolo first appears in Roman texts around the 1st century AD. The history of the medieval castle is less clear. It’s thought that either Queen Urraca (1078 – 1126), daughter of Alfonso VI of Leon, or her daughter, Sancha Raimundez (c. 1095/1102 – 1159) was responsible for its construction. In the 12th and 13th century, title of the castle rested with the Counts of Lemos. In the 15th century, during the Irmandiños revolts (peasant uprisings) the castle was destroyed only to be rebuilt in the 16th century under the patronage of Juan Francisco Pimentel, Count of Benavente. By the 18th century both the castle and torre had fallen into disrepair. In more modern times the castle found many uses including a primary school and a jail; but in 1999, under the supervision of the town council, they were restored and now form an interesting, interactive museum. 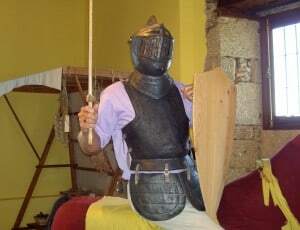 I couldn’t resist the chance to rollback the years and enjoy a boyhood fantasy: dressing up as a heavily armed Spanish knight perched atop my wooden stallion. The castle is accessible throughout the week but the tower and museum are only open Friday, Saturday and Sunday from 4 p.m. until 8 p.m. The drive home passed quickly and before long we were sitting in the garden, marvelling at the evening sky as the colour changed from blue to red. We recounted the day’s events and looked forward to our next foray into the Galician countryside.